You are currently browsing the The Accidental Hawaiian Crooner blog archives for July, 2013. Heading to Chicago for a weekend of Hawaiian Music, Hula and Fun! Are you going to be in the Chicago area this weekend? I’ll be heading Chicago on Thursday to join up with Kumu Hula June Kaililani Tanoue and Hālau i Ka Pono for a weekend of Hawaiian music, hula and fun! There will be several public events over the course of the weekend–and you are invited to attend all of ‘em! A perfect way to spend the afternoon on Aloha Friday! Next: On Saturday, July 27th, please join us for an evening of multi-cultural music and dancing, hosted by Hālau i Ka Pono. 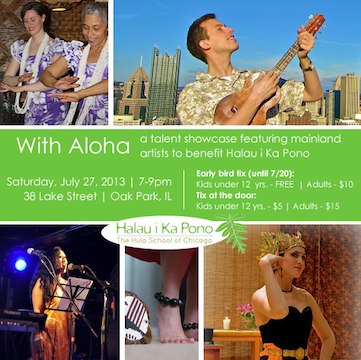 A fundraiser to benefit Oak Park’s sole educational resource for hula instuction. So it’s a weekend that promises to be FULL OF ALOHA! And we could all use some Aloha, right? Looking forward to seeing you soon, Chicago friends and family! BIG NEWS! AND A SURPRISE! This post is full of BIG NEWS. Yup. Exciting stuff is happening around here! I’M SO EXCITED TO BE PERFORMING AT PAKELE LIVE ON AUGUST 15th! It will the the second time I’ve been given the opportunity to stand on that hallowed stage where so many of my Hawaiian music heroes have stood. An honor to share mele from my heart. I’M RELEASING A LYRIC VIDEO OF A NEW ORIGINAL SONG! HEALING WATERS is one of the new songs that I’ve been working on. (I feel like I’m introducing my new baby to the world!) I was so psyched to share this with you–so I did an impromptu, live recording in the living room of an NYC apartment. And we put together a lyric video so that you can sing along! The Pakele Live Show: This time I’m so excited to have the one and only MANUWAI PETERS with me as my special guest! Manuwai and I performed together as a duo while he lived here in NYC. We called ourselves LEI MOLOKAI and we did the old-school, traditional tunes that have stood the test of time. We performed all over the place–from NYC venues to the U.S. Capitol Building in Washington, D.C. for Senator Daniel Inouye. To be reunited with my good buddy for an evening of music is a rare and wonderful treat. We’ll be sharing not only the tried and true favorites in the Hawaiian repertoire, but also some ORIGINAL MATERIAL, too! New Hawaiian songs! 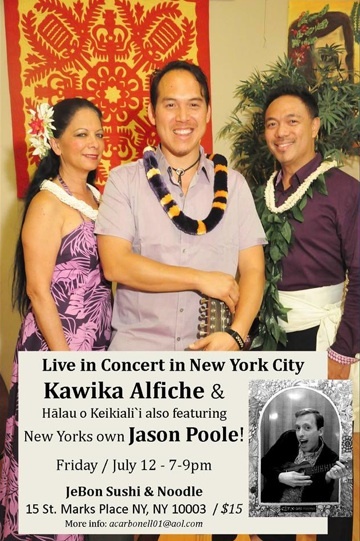 Pakele Live is presented as a live concert at the beautiful restaurant The Willows in Honolulu, HI. And it’s streamed LIVE on the web that evening. (How cool is that?! You can watch it LIVE from anywhere in the world!) Then, some shows are edited for broadcast to be presented later on Oceanic OC16. Details can be found on the website by clicking HERE. And of course, I’ll be sending out updates/reminders in future posts. I’ll share the story behind the song Healing Waters in an upcoming post, too! Video Blog: I am ‘umeke. It’s time for a new Video Blog! And this week, I’m excited to open a discussion about ‘umeke. What is an ‘umeke? Why does that image continue to inspire me and totally rock my world?